Iraqi Prime Minister Haydar Al-Abadi Saturday night, Oct. 14, gave the Kurdish Peshmerga an ultimatum to surrender the positions in the Kirkuk oil region they have held since pushing ISIS out three years ago, and also cancel the Kurdish Republic’s Sept. 25 independence vote. 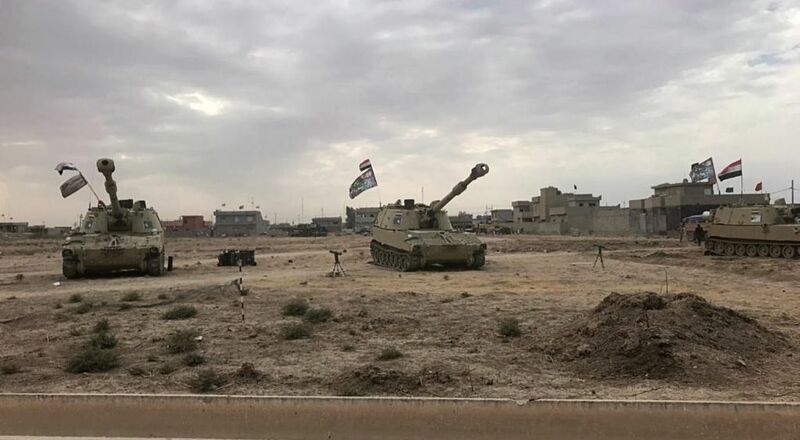 The Kurdish troops were given until early Sunday to comply with those demands, in the face of heavily armed troops of the Iraqi army and Popular Mobilization Force (PMU), an arm of the Iranian Revolutionary Guards, massed around Kirkuk. DEBKAfile’s intelligence sources reveal exclusively that the Iraqi prime minister issued this ultimatum under heavy pressure from al Qods chief Gen. Qassem Soleimani, of the Iranian Revolutionary Guards. He placed the PMU at Abadi’s disposal and any arms he might need for an operation to fight the Kurds, should they defy the ultimatum. They stand against thousands of The KRG fighters deployed around Kirkuk. Over the weekend, both sides beefed up their military strength in and around Iraq’s northern oil city. Iraq has deployed to Kirkuk the PMU as well as special operations units to face a Peshmerga force of 9,000 fighters. Just hours before the deadline, a Peshmerga commander on the western front said Kurdish fighters had “taken all the necessary measures” and were “ready for a confrontation” if necessary. American forces, who maintain a small military team in Kirkuk for carrying messages between the opposing camps, proposed a number of compromises, but they were all rejected by the Iraqi prime minister. Washington also notified Baghdad that the US would not tolerate military aggression against Irbil, capital of the KRG, Dohuk or Sulaymaniyah, or military incursions of Kirkuk, only a small party of civilian officials. It is not clear whether Abadi will heed Washington’s directives. However, DEBKAfile’s sources stress that President Donald Trump’s speech Friday night, laying out a new, tough strategy for Iran and its Revolutionary Guards, lent a potential military clash over Kirkuk a new perspective beyond a local conflict. After Trump declared that the entire IRGC was guilty of terrorism, including all its agents and proxies – the Iraqi PMU militia would lay itself open to the definition of terrorists for attacking Kurdish forces, who are America’s frontline military ally in the war on the Islamic State in Iraq and Syria. All eyes in the Middle East are watching to see how the Trump administration responds to such an attack if it takes place. Its non-response would be interpreted by Tehran as a license for its IRPG to keep going. This newest aspect of the ME cauldron is leading to that grand treaty spoken of in the Book of Daniel, whereby that as yet unknown figure will “confirm the covenant with many”. Just considering the list of players, both in the region and from outside the region, is enough to make one’s head spin. In the broadest sense, it involves the Quartet i.e., US, EU, Russia and UN. In other words the entire world community. No single player will be able to prevent the covenant from being created, or ratified. Through this treaty, the two major players, the US and Russia will be satiated. The status quo ante will be pushed to the background and a new reality brought into existence. However, as good as that may sound, it will not last…and from it will blossom WWIII. How can we be so sure it will not last? Because there cannot be world peace, or even ME peace, without the approval of the Prince of Peace. This treaty will definitely attempt to exclude the Lord Jesus Christ, and He has said that when they say “Peace and Safety”, sudden destruction will follow. It’s all in the Bible, so for those interested in their future, I recommend Daniel 9:27, Isaiah 28:14-22 and I Thessalonians 5:3 a a very preliminary warning. Students of prophecy cannot treat the Bible as Old and New Testaments. It is one book and can only be fully understood as such. the two major players, the US and Russia will be destroyed as a part of WW3, and then the agreement will come and Prince Harry, shot in the head in Jerusalem, will go off to wherever he will go (heaven or hell) and satan will enter his body and rise to the astonishment of all. You mean the devil will leave his grandmother and enter him? Will my Model 3 ship this year or is that out cause of all that forcasted doom? Excellent and yes Joel, The Word of God; written in all his 66 books is one continuous conversation that can only be understood in it’s total and entire context, both the allegorical and the historical. Stop including the Original Bible with some “New” one, by hacking the Original and calling it “Old”. The Original Bible, given to the Jews, stands on its own, independently. If Jews need a source, he has plenty of good Jewish sources, such as the 24 Holy Books of the Tanach, the Midrashim, the mishnayot and gemoras, the Rishonim and Achronim, Maimonides, and plenty of observant rabbi authors – to this very day. The New Testament (apart from Luke and Acts) was given to the Jews and is all about their Messiah and what he was doing before and after his ascension to His Father. Of course both those books record what happened to Christ and how the Gentiles were included after the Jews rejected Him. The Tanach is inspired. The others mentioned are not. Jeff, may i gently advise you to reconsider your views? Seriously. If I firmly believed that the world was square, would that really change the fact that it is round? Jeff is wholly correct. PhilipOliver is right. John is right. Aldo is right, except for excluding Daniel. Just because you don’t believe in the New Testament doesn’t mean that it is not true. And no, calling the Old Testament “old” is not a disrespectful term – it is just in contrast to the new but in agreement with it. (see final comment below) The Jews, Gods chosen people were in His heart from the beginning, but when the Jew refused the King (the Jesus of the New Testament / the Messiah of the OT) that God gave to them, Gods heart opened out to the Gentile and included all men for salvation. It is a great pity that the story of Luke 15 is a closed book to you, Jeff; a story of a Father who had two children. The elder son represents the Jew who would not enter the Fathers house of plenty. The younger son, the prodigal, represents the Gentiles riotous living away from his father – God – but returned and received the best of what was in the heart of God. I urge you to reconsider, Jeff. Sticking to your view risks you to endure the hour of Jacobs trouble (Jeremiah 30v7) (the “Old” Testament) / the hour of trial in Revelation 3v10 (New Testament). Changing your view to align with Gods view ensures your being kept out of the hour of trial. Still don’t believe me? The King of Peace the Jew refused. The Jew chose Barabbas as their man – one noted for murder. Have you perhaps noticed that the Jew has been hounded by the murderer he chose since the crucifixion of Christ until today? This fact is one of the greatest proofs of the truth of the New Testament. It is a real pity that the NT is a closed book to you, Jeff. If it wasn’t, you could read Mark 15 and judge for yourself whether you can see any truth in what I am saying. And no, I don’t hate the Jew who is still Gods chosen people. If I disrespected the Jew I would not have spent to much time urging you to see the light. Still dont believe me? Make a concerted effort to find and read the short story of THE DRUMMER BOY – the story of the great struggle of the conversion of a Jew to Christianity. It certainly takes guts for you, Greco-Roman 1/2 pagans, to come to a Jewish site and proselytize. beyond that point ca.570 B.C.E. The version you read is full of mistranslations, and deliberate alterations, which change the true meaning of His words. I have trepidation to reply. I am an original Jew whose lineage goes back to King David. I come from a family of Rabbinical scholars. We have a tradition that our purpose in this world is to be a “light unto the Nations”. That said, I always fear when offering that “light” that either one of two outcomes will occur. Either real truth will set you free to serve the Almighty with your 7 Mitzvos (commandments). The second possible outcome will be that you might give up belief in the Almighty [Altogether]. Therefore, I have chosen to go as easily as possible. Let’s begin with a question. Do you believe that the “old testament” was given to Moses on Mt. Sinai by the Almighty? The only one that is relevant is 1 Thess. 5:3. The Daniel one is about AD70. I concur with Joel. Amen. Many have not forgotten the Iranian hand in the Marine Barracks bombing in Lebanon in 1983 which slaughtered 241 United States Service personnel. Shock and Awe is insufficient to describe the payback. Kurds must fight against ibadi forces , it is not easy to establish free kurdistan.Ibadi is not powerful morally including weapon power.Also beating ibadi means beatin iran. These are the same Iraqi forces that peed their pants, threw down their weapons, left their equipment, and ran like hell away from ISIS forces. First sign of US war planes the Iranian forces will join them. Those were hollow shells, divisions on paper with a few corrupt wealthy officers and even fewer actual troops on the ground. These are Shia militia under the command of Iranian forces, vets of warfare, admittedly asymmetric warfare supported by NATO air forces. They’ve a different fight ahead of them. I suspect the coming conflict, and i think its likely to occur will closer to a near peer event. I suspect nascent peshmerga have been sufficiently equipped with enough AA assets to prevent the fledgling Iraqi air force from taking part in this conflict, sufficient AT assets to prevent the deployment of Iraqi mechanised divisions, so what we’ll be left with is artillery supported Infantry trying to drive against light artillery supported Infantry defenders. Its going to be a bloody battle but if it does break out, i dont expect the Iraqis to decisively conquer territory. Should that happen Iran may choose to attempt to intervene at which point we’ll see how committed to its allies in the North of Iraq the west really is. Will we continue to provide them with enough modern AA/AT assets to defend themselves? The coming war between Kurds and Iraqi forces is a done deal. The Kurds won’t let this opportunity for an independent country go bye especially after what they contributed in defeating ISIS up to this point on the battlefield. The question is Iran. will they support the Iraqis with Hezbollah fighters or others? that he means what he says. showing the Iranians that he has the power to act and act strongly, will set them back on their heels . this will slow any thoughts by Iran that they can keep pushing and pushing forward with their plans. it is the proverbial “”line in the sand”. The question is Turkey? They stated several times that they won’t accept an independent Kurdish state. Don’t Eff With the Kurds!!!! There will be no US conflict with Iraq nor with the Russians or the so called IRG. Even these idiots are fully aware that a conflict with the US and its allies would mean certain defeat. Fast. Furious. Over before it started. Devistating defeat. Oh, I know…nobody wants to mess with those transgenders and transvestites. Russia and Iran will attack Saudi Arabia. The US must back natural allies like the Kurds and Israelis against those in the Islamic world who see America and Israel as Big Satan and Little Satan and send their people abroad to destroy our houses from within. We have entered the tribulation people. I’m a Christian. Jews are right to express offense at the term Old Testament frankly as it sounds on par with the Superceded Testament or the old detergent before New Improved Tide arrived. It’s not old to them. Let’s not interject prophesy at this time. Russia,China,Iran,Turkey, and Hezbollah, were already making their moves in early 2008. You will not see prophesy fulfilled until it is fulfilled. The book of Esther took 12-13 years to be completed. This whole event is not completed until it is finished, and it will be a greater miracle than the EXODUS. When all the the enemy is vanquished, we will see what G-d’s prophesy looks like according to His interpretation. This drama will play itself out, and we will see the true strength of Ha Kososh Boruch Hu. The US. Air Force will lead the Kurds to victory over the Iranians. Trump is not playing games.